What Would Kate Wear... To Dinner? - What Would Kate Do? 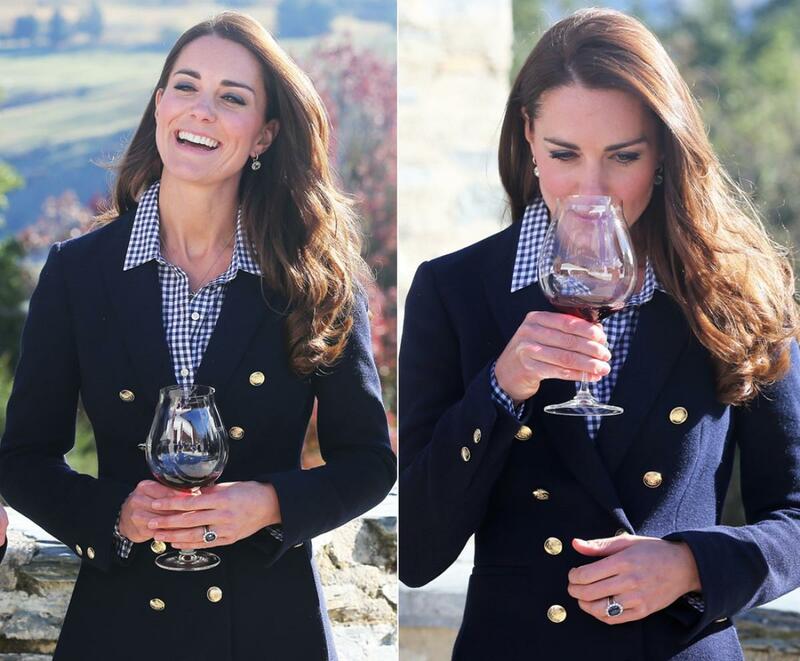 Let’s imagine for a moment that Kate could go out for dinner with her husband and be guaranteed that there would be no paparazzi, no hounding fans, no security threats – and have not to worry about little royals causing a fuss since there was a fantastic babysitter at home to watch Prince George and Princess Charlotte. (Sigh. Every mother’s dream – you know, the babysitter part. Not that we know about the paparazzi…) While some might ask where she might go (Bluebird? The Goring? ), others would ask the question that Kate fans are renowned for… What would she wear to such an event? We get asked this question often and thought we would share our take on common events Kate might take part in in our new series called What Would Kate Wear…, starting with today’s question of what Kate might wear to various types of dinners. While both living in Norfolk and while they were attending St. Andrews, Will & Kate were known to frequent small pubs and restaurants, popping in for a casual meal to escape the prying eyes of paparazzi and enjoy each others company. Even when dressing casually, Kate is always very well put together – going out for a dinner with her husband would warrant more effort than a pair of jeans and a t-shirt! Kate’s casual looks are extremely well thought out and frequently pull in pieces of her wardrobe that we see on a more formal basis. We think she would look ravishing for a dinner in a simple black wrap dress – like this one from DVF, a pair of tights to ward off the fall chill, a pair of high-heeled boots (we think her oft seen Aquatalia pair could fit the bill), a classic handbag from her collection (like a Tod’s D-Styling bag) and a nice jacket like this updated Burberry trench. And a look for fall would not be complete without a warm scarf/pashmina to keep her warm if needed. Little Black Dress – Kate was frequently seen in a black wrap dress from Issa before her wedding, like shopping on King’s Road in April 2011. While we all know the inability for Kate to continue wearing her Issa pieces, it’s undoubtedly still a silhouette that looks great on her and the wrap feature would make the dress more casual, perfect for a dinner. Red Pashmina – Kate is frequently seen wearing a red pashmina, whether it was at Wimbledon in 2014 or on the Canada Tour of 2011. The Cambridges love living in the country, and I like to imagine them ringing up a sitter (or nanny Maria) to watch the kids while they head for a bite to eat at a local pub. Wanting to be relaxed and comfortable – and yet always stylish – we think Kate would opt for some jeans with a blazer for the night out. 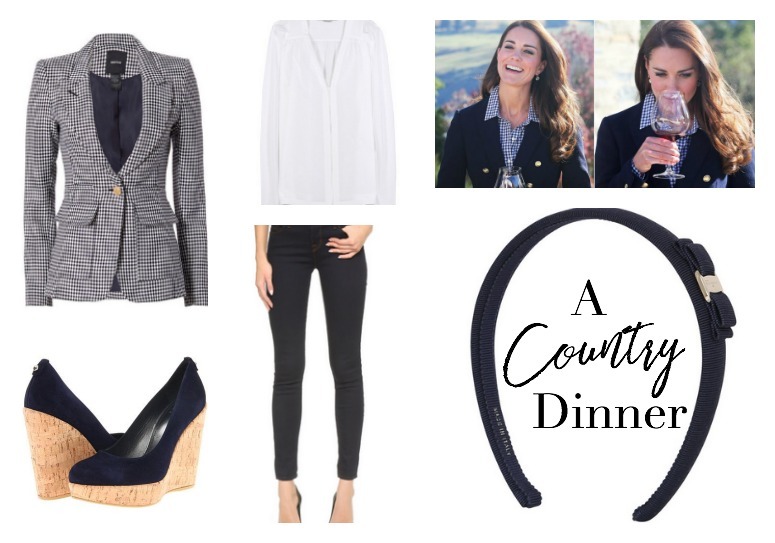 Pairing skinny jeans which usually scream casual with her beloved wedges and a fun jacket make a casual yet refined and chic look that is not too dressy for a country dinner… When you’re a Duchess! We have seen more and more of her wearing headbands (alice bands) lately, so perhaps we’d see a new one of those too? Blazer: We turned to a look Kate donned in New Zealand for inspiration, mixing it up by adding the check pattern to the blazer in a brand Kate loves (Smythe). The pattern on the blazer is a statement, so we paired it with a muted silk blouse for balance. Chic Handbag: Kate wore a Victoria Beckham handbag to Wimbledon this year, and so it’s not a stretch to think she might own the classic shape in another colour. Headband: Kate’s been spotted with a headband (or alice band) this year, and since she’s in the country, a classic band to go with the look might fit in really nicely. She’s worn Salvatore Ferragamo in the past (before the Royal Wedding) so perhaps this is the headband to bring her back around to the Italian brand? Kate used to be seen out and about in London at the chicest restaurants before she was married – and we bet she’d love to step out with some friends to a chic restaurant again for drinks if she could. Perhaps a gathering of girls to raise a glass to Pippa’s engagement? A quiet catch-up with school friends? We definitely think that Kate would wear a dress – like this gorgeous Prada navy pleated dress in a silhouette that looks stunning on Kate. Because it’s a dinner and not a formal engagement, we would think that Kate would pair the dress with a structured cardigan, like this one from Ted Baker, which would provide some coverage to her arms and yet still look chic and relaxed. And because we know Kate loves to wear fun earrings, these Tory Burch quirky ones would be a great fit with the hues of the outfit – and we know she loves the brand! Chic Navy Blue Dress: Kate loves the style of the Prada dress we list above, we have seen her in the same shape in this Mulberry dress from the Southeast Asia tour. We’ve also seen her in pleats several times, and we know how much the Duchess of Cambridge loves her navy blues! Diamonds by the Yard: On the Royal Tour of Canada in 2011, Kate was seen with a Tiffany Diamonds by the Yard bracelet, so it’s a good guess that she loves the clean simplicity of the line, and that a simple, elegant Diamonds by the Yard necklace would be just the right balance for the quirkier earrings. Okay, so this one is a little far fetched for a Duchess – we get that. But this kind of question is one we get often! How can you incorporate Kate’s style on the cheap in our everyday lives? Since we know Kate is a fan of bargains from her shopping at discount outlet malls to picking up earrings on the side of a mountain in Bhutan for mere pounds, we can imagine that she would approve of our endeavours… This time, to find an ENTIRE outfit for under $50. And we did it, actually coming in under budget at $48.77! We paired a black and white dress with plain black pumps (which are under $10!) and some simple gold jewelry… And trench coat! While Kate would definitely not love the quality of some of these articles – even her “cheap” shopping is of high quality High Street stores – we all acknowledge that that’s just sometimes not realistic in the “real” world, so while this look is great, try and save up for some quality pieces if you can! Black and White Dress: Kate chooses this plain and simple look on a regular basis, including this Jaeger dress. There have been so many over the years that we couldn’t start to name them all, but think of the Tory Burch from Australia or black and white Zara lace from 2011. Kate has also been wearing more colour blocking lately with her choices of Roksanda dresses, so we think the bold geometry of this dress could appeal to her – and flatter curves! Trench Coat: Kate loves a good trenchcoat, and while she has chosen Burberry in the past, that’s not in everyone’s realm of possibility without a whole lot of saving up! We think she’d appreciate the classic styling of this repliKate and definitely find the price attractive if she didn’t have a royal wardrobe budget! 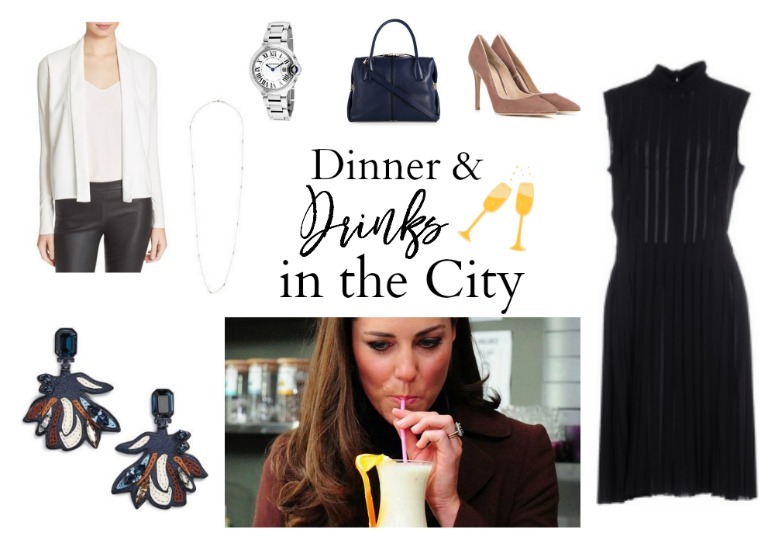 What do you think Kate would wear to dinner? Is there something we have missed? We’d love to hear your thoughts and see what pieces you would select that the Duchess could wear – we’ve even created an inspiration board about it on Pinterest that we’d love for you to join and share your thoughts on. Stay tuned for the next instalment of What Would Kate Wear… where we look at what Kate might wear to pick up George from nursery school!